Build and beyond: Kids activities | Playground build toolkit | KaBOOM! The big day is here! Your advance planning should make the day go smoothly, but you'll still need to stay on your toes. Your co-chair(s) will need your help in creating a detailed site layout that shows the location of all the teams' activities. To do your part, sketch the location and orientation of the children's activity tables. If you have a choice of where to set up, keep safety in mind: you want children to be in view of the build site, but at a safe distance. Remember that children are not allowed on the construction site. A partially enclosed area helps with supervision; it's also a good idea to place children near a shady, restful spot. An official build timetable is another way for co-chair(s) to ensure that everyone is on the same page...literally! It's essentially a script for site prep and Build Days, a single document that pulls together all the teams' activities and lists them in order. Your co-chair(s) will need from you a detailed Children's Team schedule including your team's arrival times, deliveries of supplies, major children's activities, and who will be participating in each task. The playspace build is a big deal to you and your team, but it may slip the minds of busy supporters. They may also realize, at the last minute, that they have scheduling conflicts! Check to make sure that all of your donors have received written confirmation letters, clarifying the details of their contribution and inviting them to the build. Then divide your donor and volunteer lists into small groups and have each of your team members perform follow-up calls. These should be conducted no more than one week before the build. Are all your supplies on hand? Will any be picked up or delivered the day of the build? Do you need to make purchases? Check with your donors and volunteers to confirm that all supplies will be arriving as needed. Just in case you need popsicle sticks or glue at the last minute, designate a "runner" who will have a car on hand. Be sure to talk to your co-chair(s) about whether petty cash will be available, and how it will be disbursed. If volunteers are late or absent, do you have someone you can turn to? Work with your team members to develop a list of names or organizations who might help you in a pinch. You may need a way to contact donors and volunteers from the build site. Make sure that you have a cell phone and that important contacts have the number where they can reach you. Where will children's activities be held? How many children and how many supervisors are you expecting? Are there any times when children will be present on the build site, such as mini-tours or visits? What is the children's role in the ribbon-cutting ceremony? First thing in the morning, set up the children's area and make sure it's clearly marked. Count your supplies. Note the location of the first aid kit or station. As your volunteers arrive, greet them and make sure that they're properly registered with the Recruitment Team. Explain the children's sign-in procedures and answer any questions about the day's activities. Check your timetable to make sure that volunteers are showing up to fulfill their shifts. Help parents register their children as they arrive; it's important that they give their consent and understand project procedures. Be sure to record any food allergies or special needs, along with emergency contact information. Be aware of what's going on at the construction site throughout the day; there may be opportunities for the children to visit or lend a hand with side projects. Note children's level of engagement and energy - they may become tired, thirsty or bored quickly. On the flip side, you may find that certain activities are taking too long. That's ok! The goal is to keep children occupied. Keep the children's area as tidy as possible, and conduct a thorough clean-up at the end of each day. Encourage everyone to have fun! Tip: If you have access to a camera, take pictures of sponsor-recognition signs or banners displaying the names of businesses who donated supplies. Be sure to get action shots of the kids enjoying themselves (but first, make sure you have photo releases signed)! These can be sent with thank-you letters to show your appreciation. "During the first day of the build, parents kept checking in to see if their kids were okay. I think some of them even said they were quitting early because they needed to take their children home. The problem was that the kids did not want to go! We had so many activities planned - coloring contests, castle building, pin-the-tail on the elephant - the kids were having a great time. In some cases, that meant mom or dad had to turn around and work on the playground a few hours longer. I think that was our success...we made it so they couldn't use their little Jimmy as an excuse!" After the last bolt is tightened and the last pile of surfacing is raked underneath the new playground, it's time to finally CELEBRATE the achievement of your long-standing goal! A festive post-build ceremony can distinguish a good build from a great and memorable one, because it magnifies the pride and emotion felt by all the playspace builders and volunteers. An official ribbon-cutting ceremony is also a great chance for you to bring the "designers" of the playspace, the children, back onto the site for a photo opportunity. Volunteers at the Girls, Inc. build in Omaha, Neb., were treated to a personal poetry reading that honored their service. Ten girls also spelled out V-O-L-U-N-T-E-E-R-S, with each letter representing a quality shared by the community builders. Every student at Immaculate Conception in Memphis, Tenn., colored a paper doll to look like him/herself. All of the dolls were cut out and strung together with yarn, making a special chain for their playspace's Ribbon-Cutting. The roster of guest speakers for a ribbon-cutting ceremony in Little Rock, Ark., included a congressman, superintendent of schools, the president of the PTA, and a representative from CNA, the corporate sponsor. The person chosen to cut the ribbon, however, was the 8-year-old girl whose drawing had been chosen for the event's t-shirts. The Santa Monica, Calif., YWCA finished their Build Day with a simple milk-and-brownie toast! As the concrete cures on your new playspace, kids will be eagerly waiting to pounce on the new equipment. Swings, slides and climbers need no introduction! However, children may not understand the limits of their new playspace. This is your last chance to reinforce rules and procedures before unsafe habits get underway. Work with your co-chair(s) and fellow team captains to schedule a special playspace-orientation session that covers affirmative rules for the space (what to do, instead of what not to do), emergency procedures and simple daily maintenance. Then celebrate your success the right way...by playing! Can you think of people who deserve a special thank-you for their hard work and support? Let them know! By taking the time to recognize them and make them feel appreciated, you ensure that they'll stay involved in your community in the future. If you had to do it all over again, what would you do differently? What worked and what flopped? Your experience will prove invaluable to community organizers down the road, so take the time to record your team's thoughts. 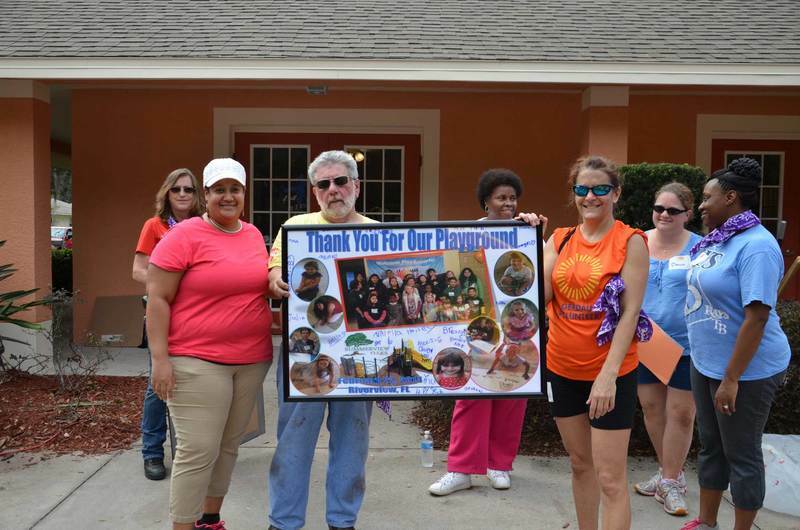 Your co-chair(s) or fellow team captains may be interested in forming an ongoing group to support the maintenance and programming of your new playspace. Children's team members can contribute by maintaining relationships with sponsors and volunteers, and giving them new opportunities to be involved. You might suggest ongoing programming ideas such as clubs, recreation classes or after-school learning. You could lead children in new service endeavors to enhance the playspace or take the message of safe play to other neighborhoods.